Ordinate dimensions might be what you are looking for. andrew wrote: Ordinate dimensions might be what you are looking for. Ordinate dimensions measuring from 0.0, I need from a variable. Besides the ordinate dimensions have no arrow. Is simpler, it's a dim that only has an arrow and the text is aligned to one side. 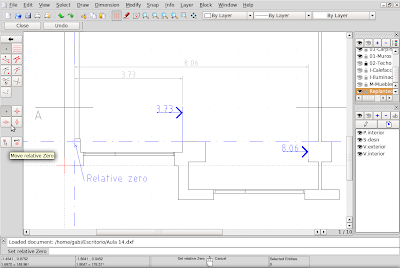 Dimension entities that look exactly as shown in your figure are not supported by QCAD. 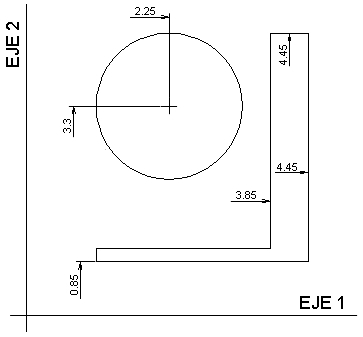 Is there a way to set the ordinate 0,0 to a relative location before drawing dimensions so we don't have to move it after drawing the dimensions? I need not be identical to the image, but the levels I tried were really bad. Is there a way to customize your appearance? ggsalas wrote: Is there a way to customize your appearance? I want to know whether it is possible to place a text that shows the value of the coordinate (in x). Maybe you can use scripts? With blocks and/or scripts this can be possible? With a QCAD 3 script, this is certainly possible. This script lets the user click a position and then adds three points beside each other at the chosen position. Instead of adding points, you can add any other entity type, including text labels.